The Royal Palace on the Meir was renovated some years ago and houses – at the moment – a fine dining experience, an over the top party location and, last but definitely not least, The Chocolate Line. Mr Dominique Persoone started out in Bruges, became world famous in Belgium and opened a second store in Antwerp. He designed a chocolate inhaler for The Rolling Stones, and makes chocolates on demand for restaurants with a star or two. He grows his own cocoa beans somewhere in Mexico. He wrote a few books (well yes indeed, about chocolate). Taken all together, he is a chocolate king. So he absolutely deserves his palace. So do his chocolates. They’re royalty. Go and have some! It’s also possible to buy the chocolate he uses in big chunks. White, milk and dark chocolate with different percentages of cocoa. 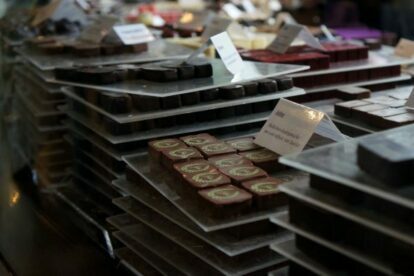 And not to forget, the homemade mixture of milk chocolate and dried red fruits, available in bigger and smaller pieces to your liking.